UPDATED: Fri., Oct. 26, 2018, 12:09 p.m.
BILLINGS – Spending in Montana’s U.S. Senate race has hit $60 million and shattered a state record as conservative groups funded by wealthy donors saturate the airwaves with ads attacking Democratic Sen. Jon Tester and seek to capitalize on President Donald Trump’s feud with the lawmaker. A political group backed by Las Vegas gambling billionaire Sheldon Adelson, the Senate Leadership Fund, spent about $1.5 million on anti-Tester ads over the past week and plans to double that amount in coming days, according to campaign filings and a spokesman for the group. The spending began the day Trump visited Montana to promote Republican challenger Matt Rosendale and bashed Tester for derailing his nominee for Veterans Affairs secretary, Ronny Jackson. Rosendale, the state auditor, trails far behind in campaign donations and entered the race lacking Tester’s wide name recognition. That leaves him heavily reliant on surrogates and groups that have shelled out a combined $19 million as of Friday to topple the two-term incumbent and protect Republican control of the Senate. Democratic-leaning groups also have been spending heavily. Combined with contributions to the candidates, the total amount that’s poured into the contest has reached $60 million, according to an Associated Press tally. Even when accounting for inflation, it easily shatters the prior Montana election record of $47 million during Tester’s 2012 re-election campaign against former Rep. Denny Rehberg. Most of the money has come from so-called super PACs, political committees that can raise unlimited money but are barred from directly coordinating with candidates. With less than two weeks remaining in the race and absentee ballots already coming in, the heavy spending reinforces the perception that Tester is again vulnerable after two previous narrow victories in a state that’s been putting more Republicans in office over the past decade. Adelson and his wife have donated $50 million of the $121 million the group has raised this election cycle, according to campaign filings with the Federal Election Commission. In addition to Trump’s three visits to the Montana to campaign against Tester, the president has dispatched Vice President Mike Pence to the state twice. His son, Donald Trump Jr., on Friday was to begin an eight-stop tour of the state with Rosendale and Republican U.S. Rep. Greg Gianforte. Other groups backed by wealthy donors also have been spending heavily against Tester, including Restoration PAC and Club for Growth, which are backed by Illinois billionaire Richard Uihlein and another committee, the Senate Reform Fund, funded by Texas oil executive Tim Dunn. Trump targeted Tester in April after the Democrat released allegations against Jackson of drunken behavior, overprescribing prescription drugs and fostering a hostile work environment. Jackson has denied the accusations, which remain under investigation by Pentagon officials. Tester has avoided taking on Trump directly and instead talks up veterans’ legislation he sponsored that was signed into law by the president. 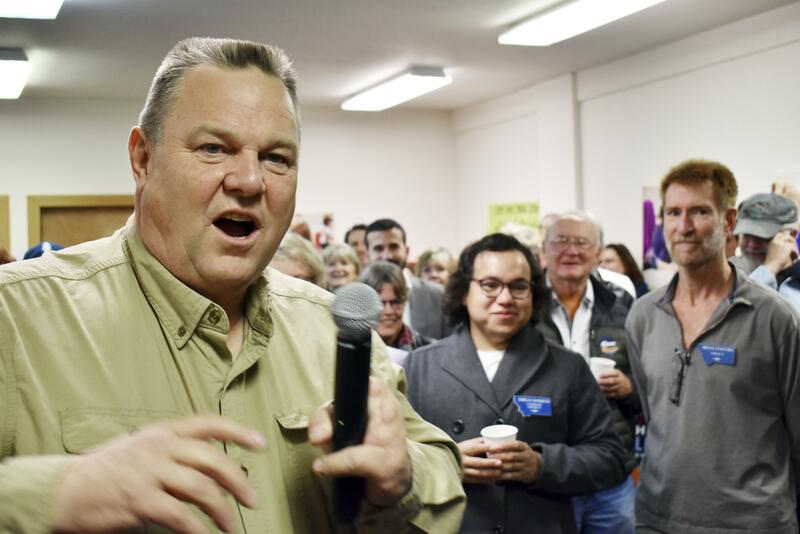 Tester for his part has gotten a huge financial boost from deep-pocketed political groups, including those representing unions, conservationists, hospitals and banks. They’ve spent more than $16 million promoting the Democrat and attacking Rosendale as a real estate developer from Maryland who won’t protect Montana’s public lands. Published: Oct. 26, 2018, 10:10 a.m. Updated: Oct. 26, 2018, 12:09 p.m.